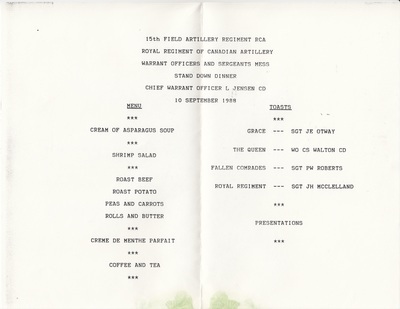 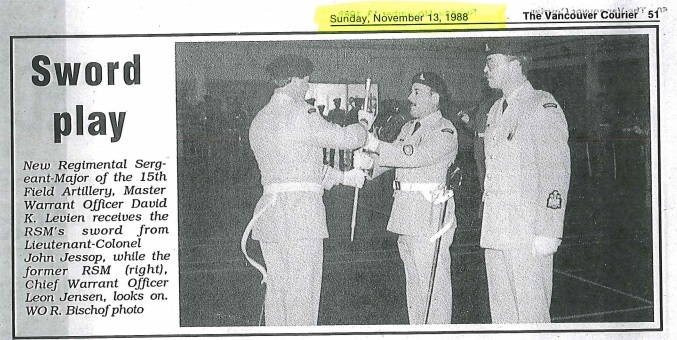 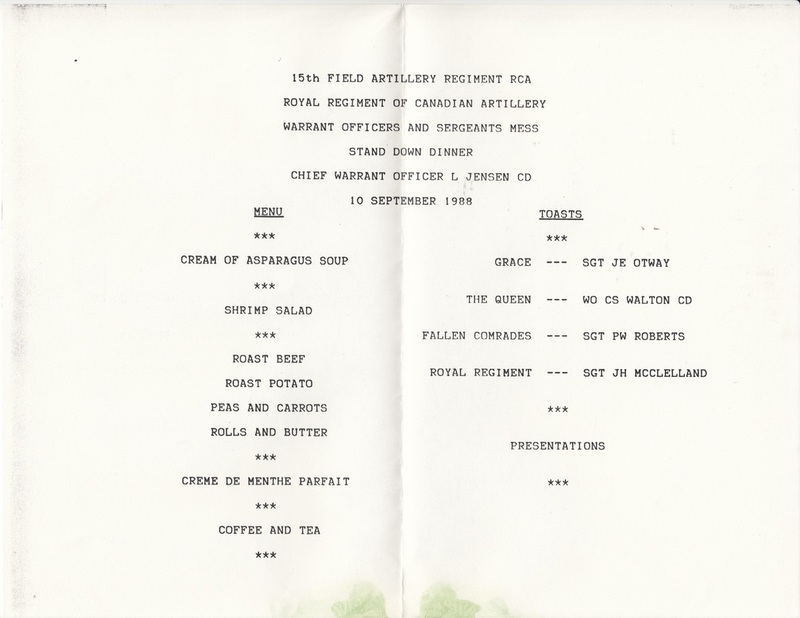 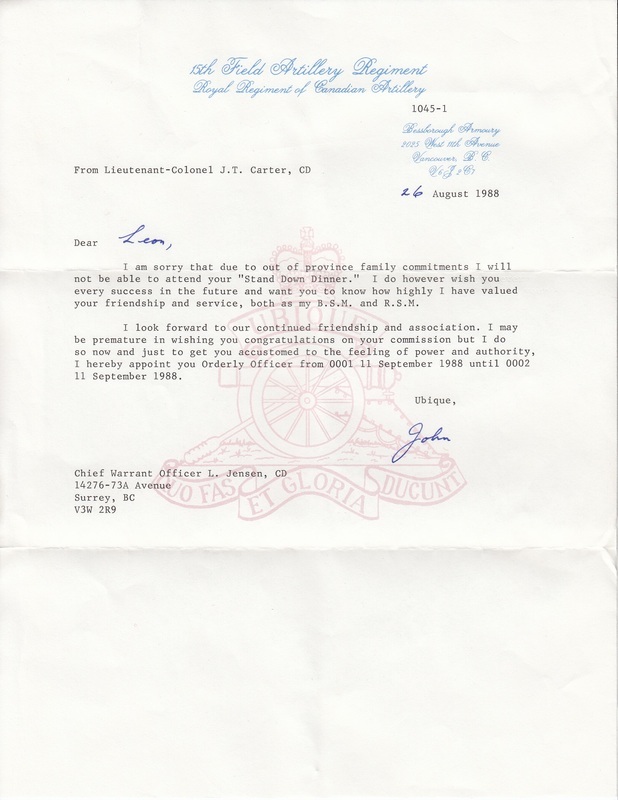 1 Sep 1988 Lieutenant-Colonel John T Carter, CD appointed Commanding Officer. 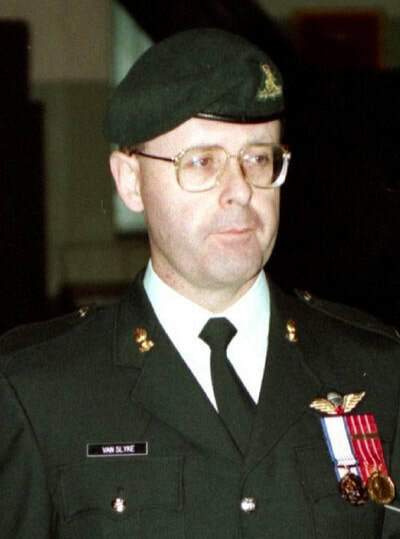 Master Warrant Officer David K Levien, CD appointed Regimental Sergeant Major. Brigadier RT DuMoulin, ED, CD appointed Honorary Colonel. 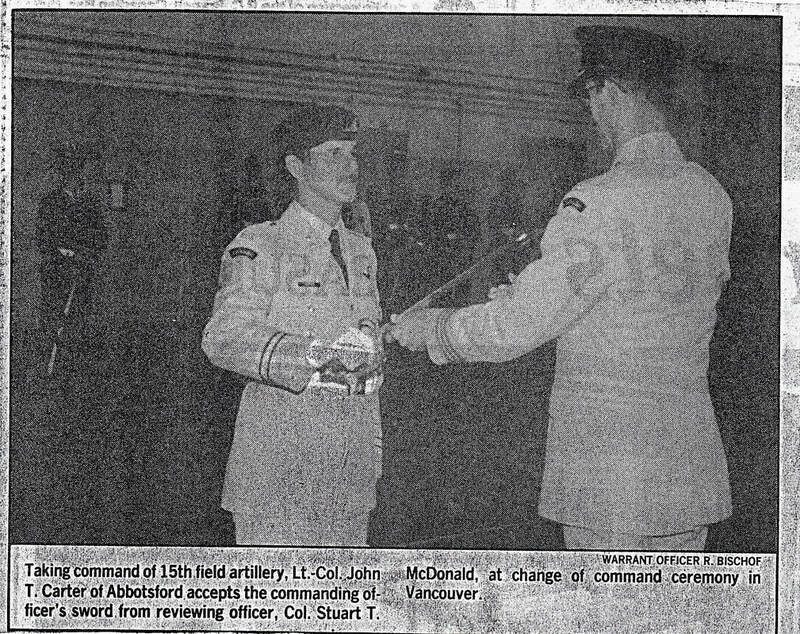 Lieutenant-Colonel RJ Webster, CD appointed Honorary Lieutenant-Colonel. 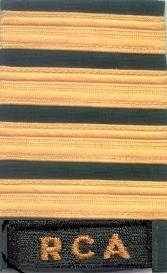 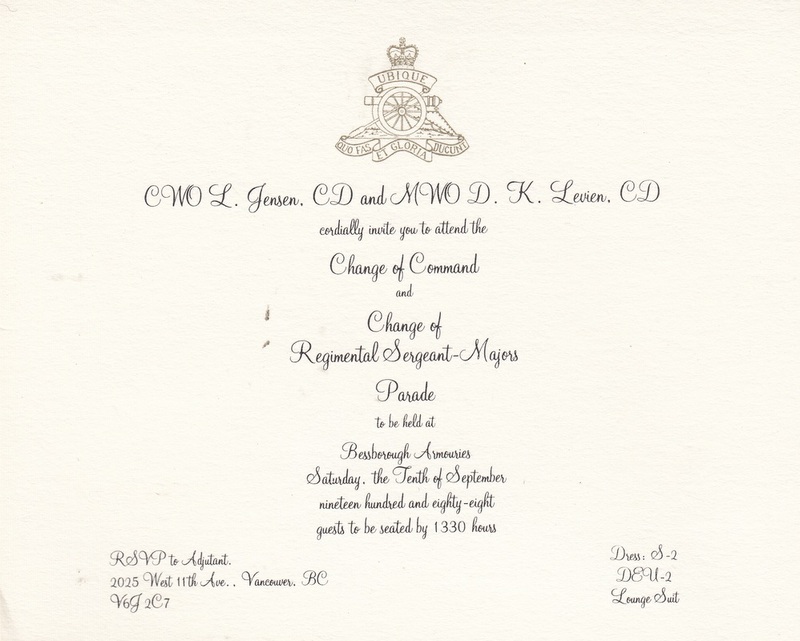 1 Jun 1988 Chief Warrant Officer Leon Jensen CD commissioned from the ranks to Captain. Lieutenant-Colonel John Carter CD takes over command from Lieutenant-Colonel John Jessop CD. 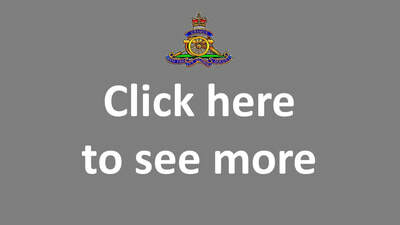 Master Warrant Officer Dave Levien CD takes over as Regimental Sergeant Major from Chief Warrant Officer Leon Jensen CD. 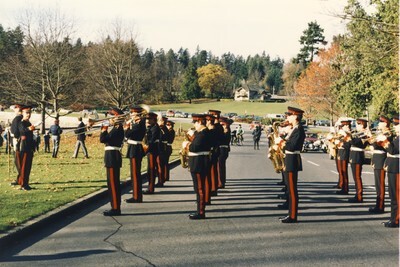 The photos are most likely from that parade. 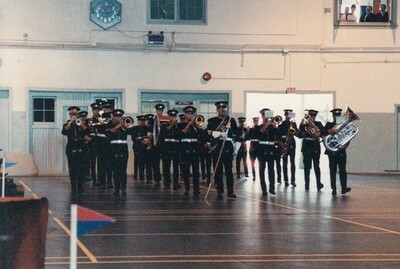 The faces on parade and the rank that I can make out all seem to indicate 1988. 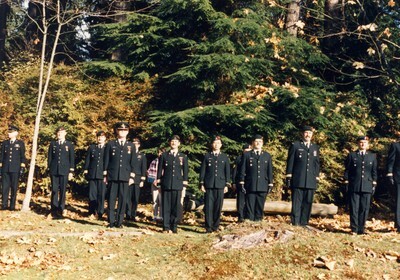 Private Dawne Larsen, Warrant Officer Cliff John, Sergeant Jennifer Jackson, Master Bombardier Eric Goodwill, Master Bombardier Ernie Kovacs, Sergeant Donato Calogero. 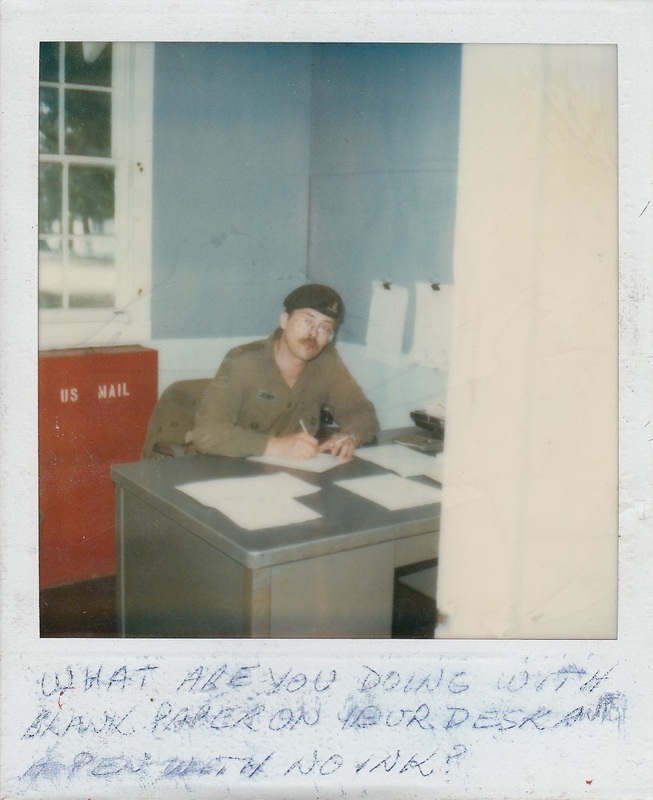 Did I miss your name? 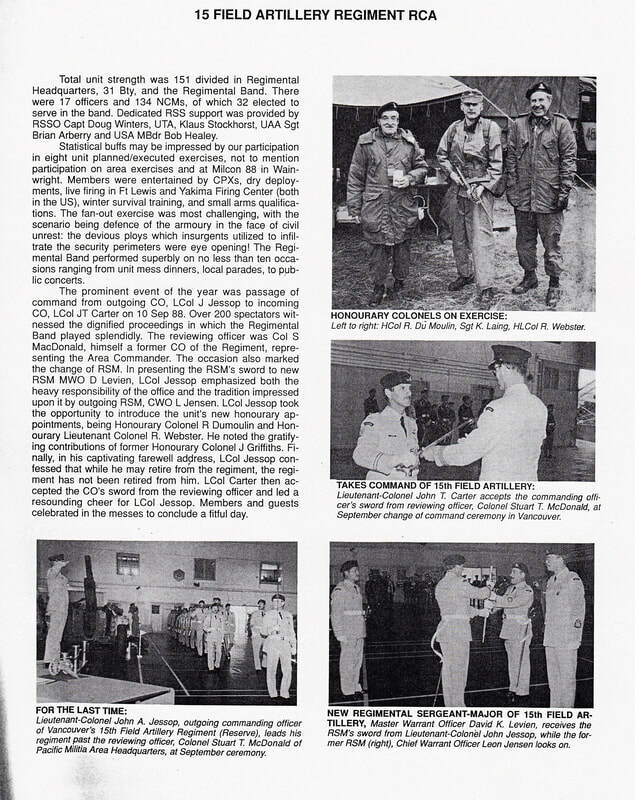 Master Corporal Kenneth W Francis deploys with United Nations Force in Cyprus. 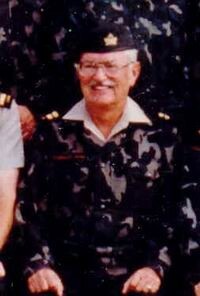 Major Bob RJ Foulis Pacific Militia Area Chaplain. 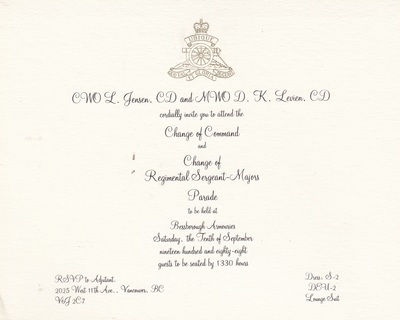 Major Peter N Moogk Asst Public Affairs Officer. 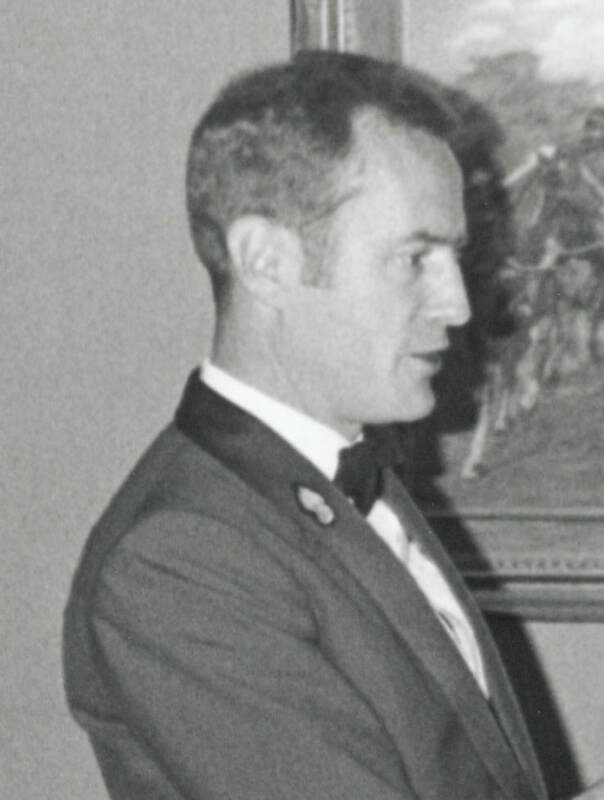 Colonel Stuart T McDonald CD ACOS Administration. 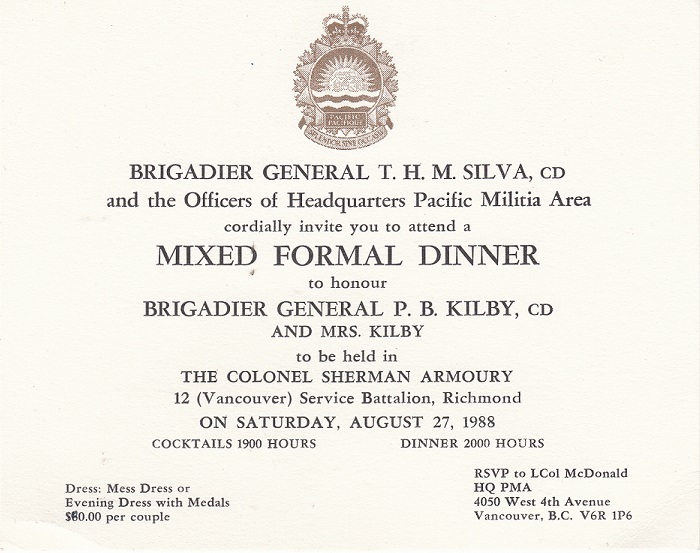 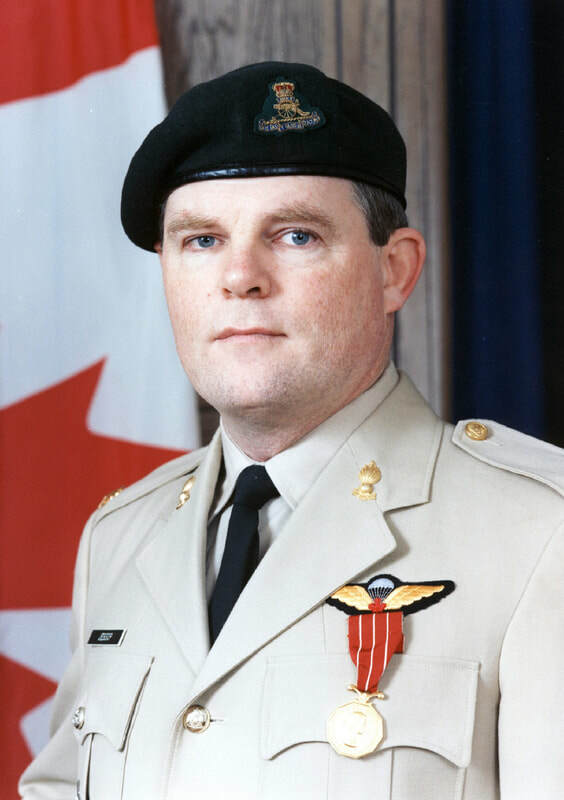 Colonel Stuart T McDonald President of the Royal Canadian Artillery Association. 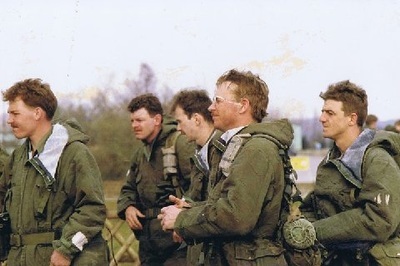 Captain Graeme W Stewart Staff Officer Operations. 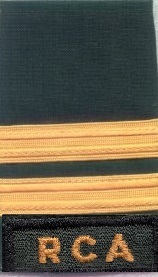 Master Corporal Kevin E Walker DA Verification. 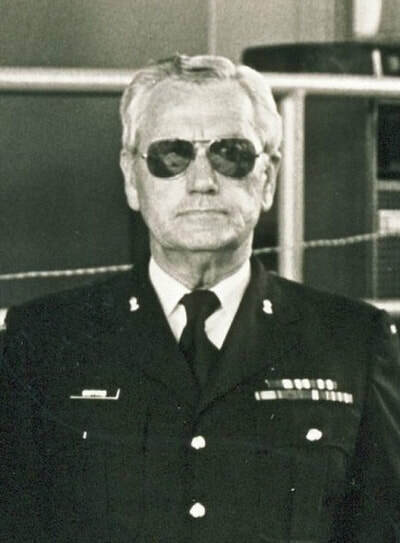 Captain Dan G Wort Staff Officer 3 Operations. 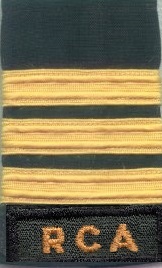 Master Warrant Officer Vic T Yano Staff Officer 3 DA Verification. 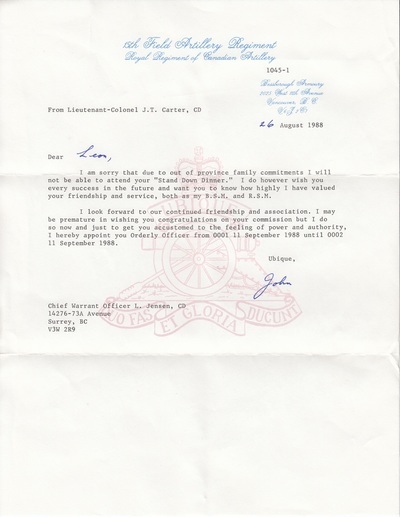 Chief Warrant Officer Leon Jensen CD to District Headquarters as G1 SO2 / G1 11 CBG(T). 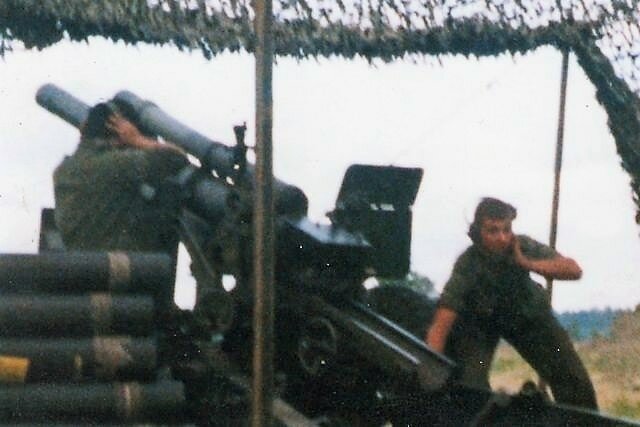 ​Private Jon Denney firing the 105mm C1 Howitzer for the first time. Photo taken by Bombardier Kevin Rankin. 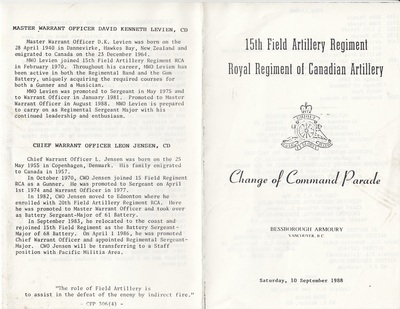 Gunner George M Dempsey W Battery, Gagetown, NB. 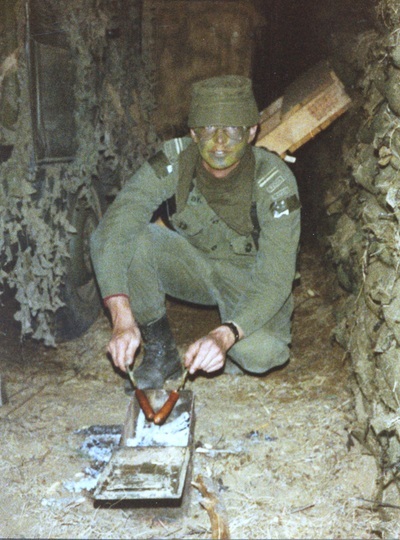 Second Lieutenant Noel RR Dykes, CD Air Defence Troop Commander "U" Bty, 3rd Regiment Royal Canadian Horse Artillery, Shilo, MB; Promoted Lieutenant; attended WAINCON 88 where Command Post was completely dug in; Jun 88 posted Air Defence Troop Commander, 127 Air Defence Battery, 4 Air Defence Regiment, Canadian Forces Europe, stationed in Ettenheim, Federal Republic Germany (unit located in rented soft drink bottling firm as 4 AD buildings weren't ready). 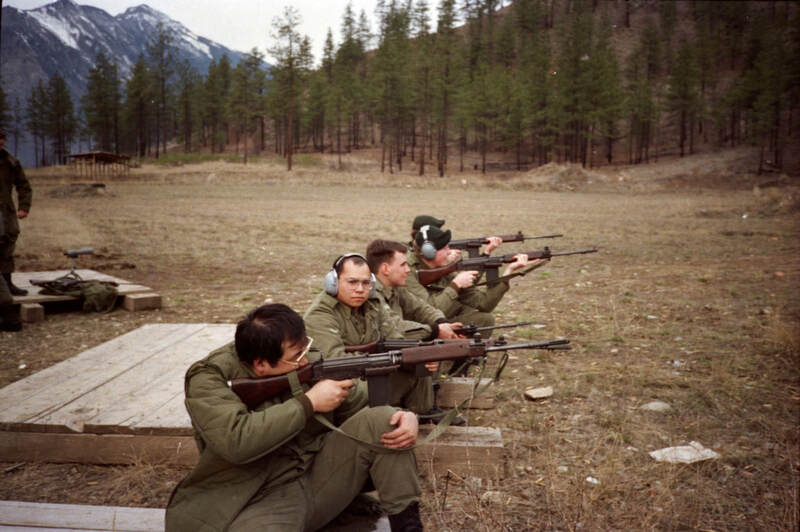 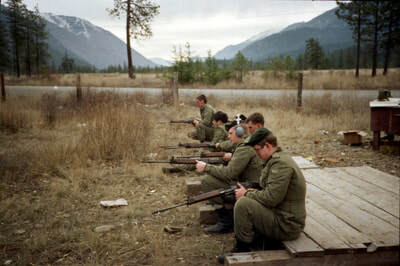 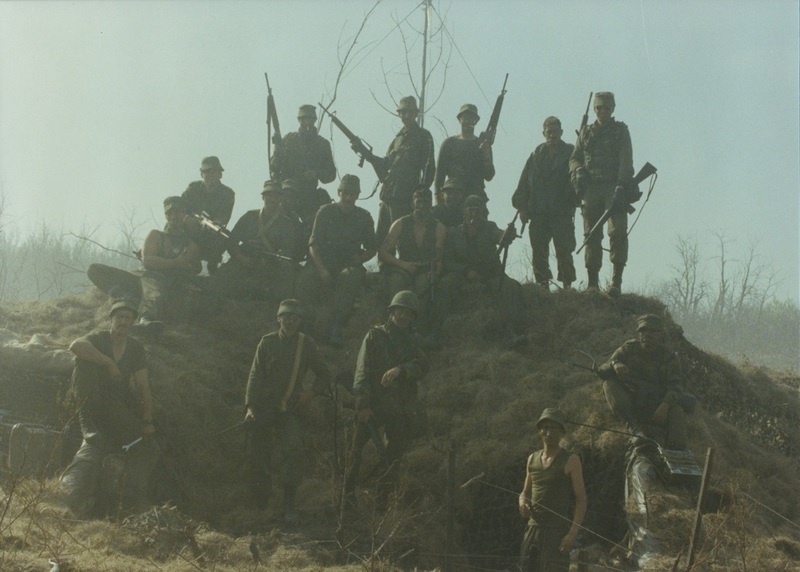 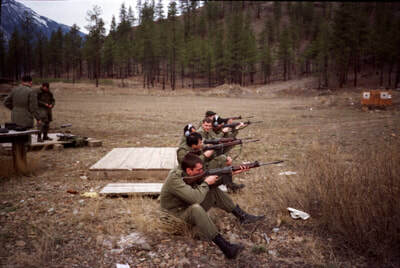 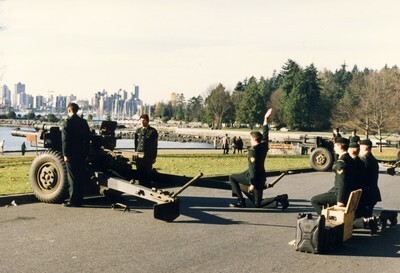 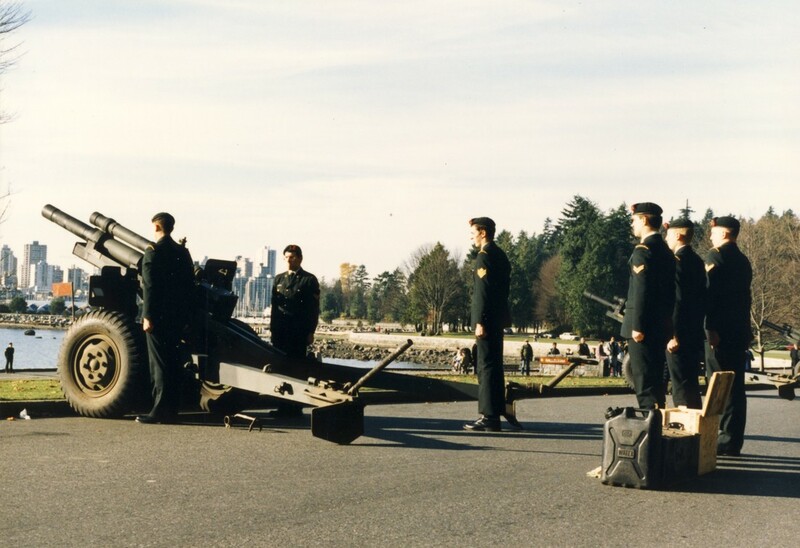 Sep - Dec 88, Advanced Air Defence Officers Tactics Course, Air Defence Arty School, Chatham NB. 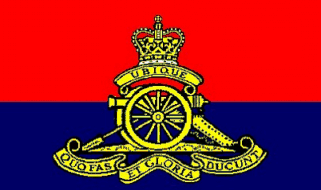 4 Jul 1988 Master Warrant Officer Colin Norris posted to “E” Battery (Para) 2nd Regiment Royal Canadian Horse Artillery as Troop Sergeant Major. Captain John P Pulchny posted to FMC Headquarters, St Hubert, QC. 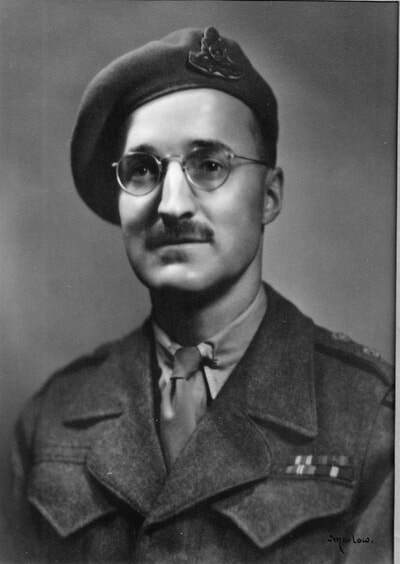 Sergeant Paul A Stewart 1st Regiment Royal Canadian Horse Artillery, Lahr, Germany. Major Gary S Woloski posted to LRMP, Ottawa, ON. Captain Eric Tyldesley-Gore CD assumes command of 1705 Army Cadet Corps, Vernon BC. 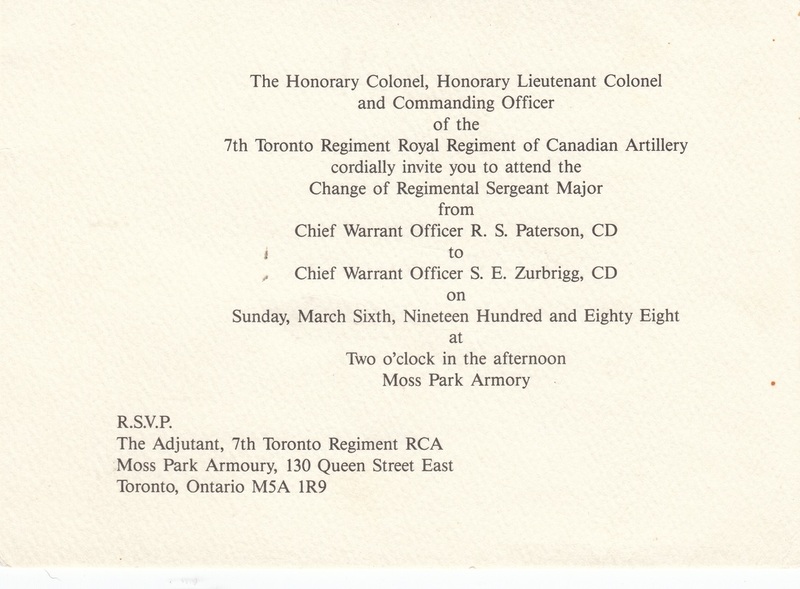 ​Chief Warrant Officer Ron Paterson, stands down as Regimental Sergeant Major for 7th Toronto Regiment, RCA. 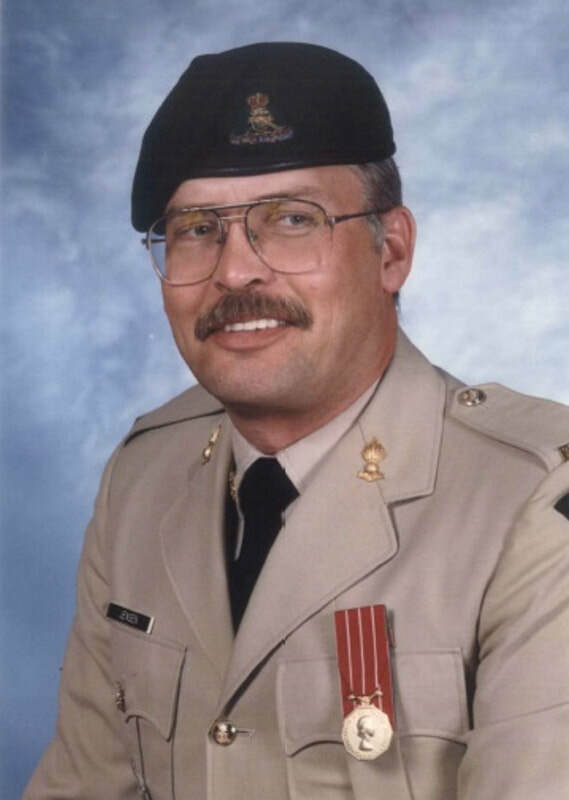 Ron had been with 15th Field Artillery Regiment from 1981 until 1983 . 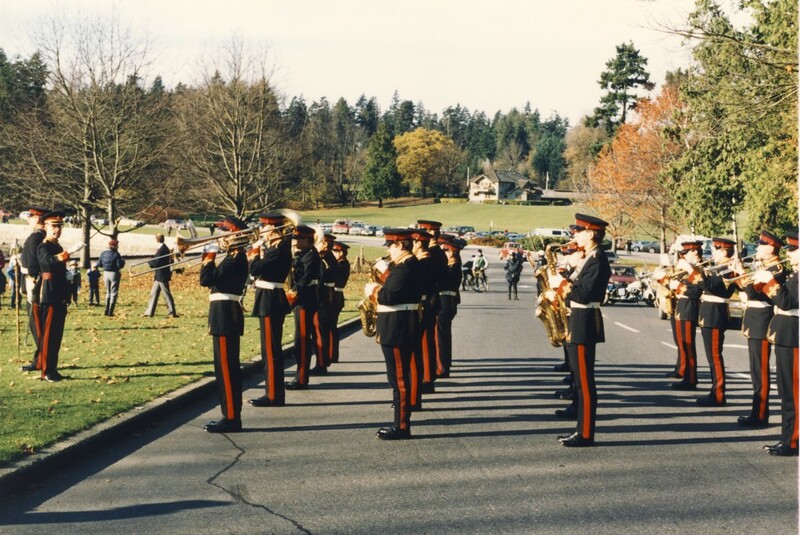 The Regimental band performs at the Queen Elizabeth Theatre on 6 November. 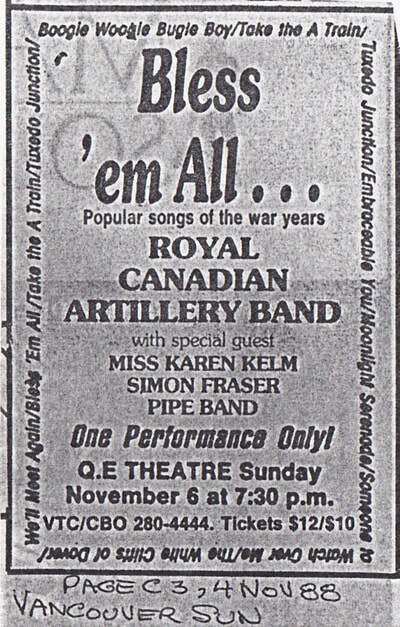 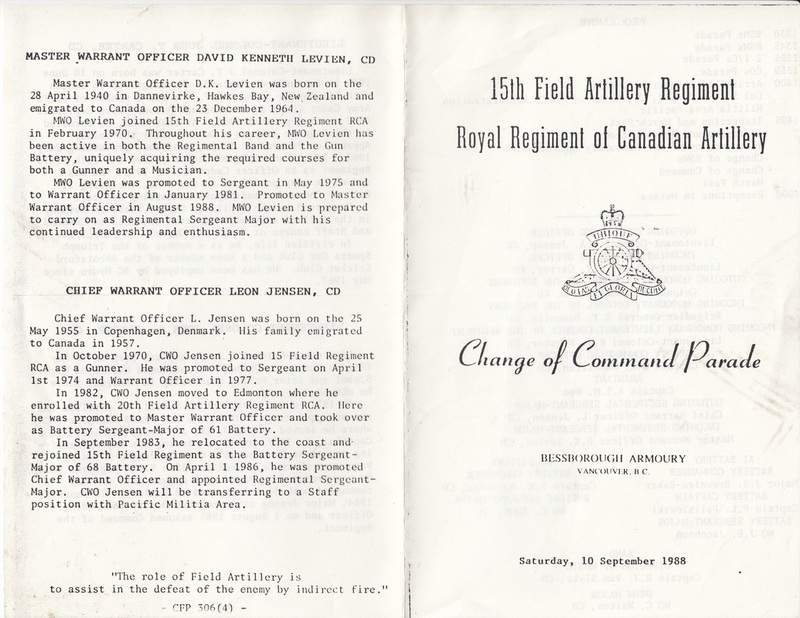 The 15th Field Artillery Regiment's annual submission to the Canadian Gunner magazine. The remnants of what was to be a glorious Regimental Vehicle Museum. 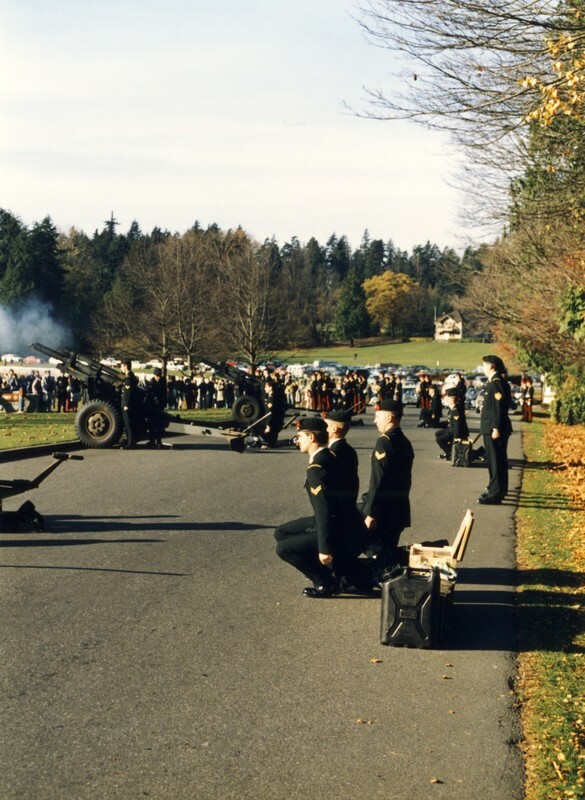 Unfortunately, someone apparently deemed that there was insufficient storage space for a museum with so many vehicles and they were transferred to other military museums across Canada. Captain Donald Stewart Friedsam, CD died of a massive heart attack on 27 January 1988. 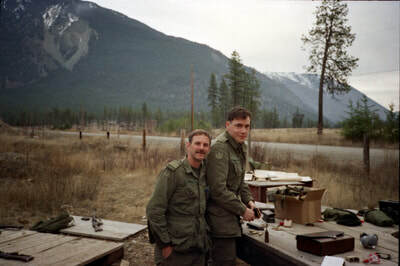 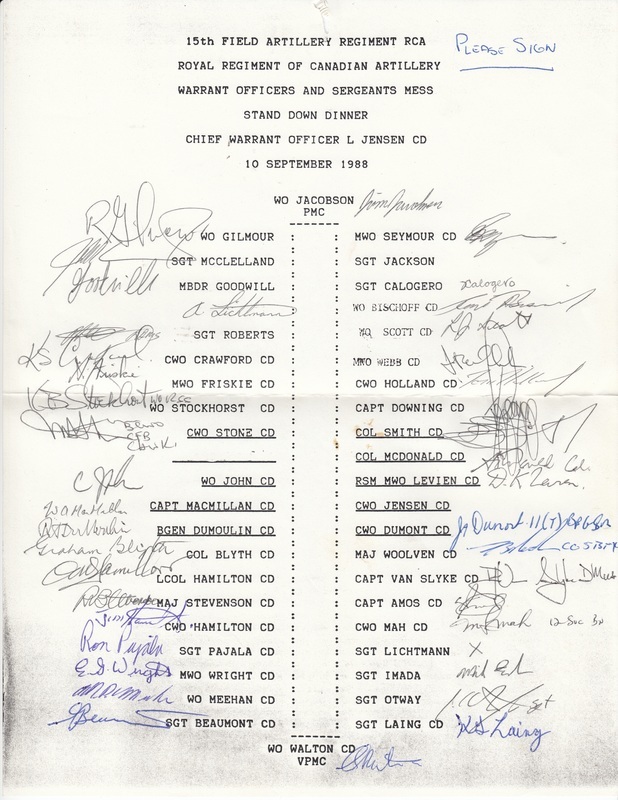 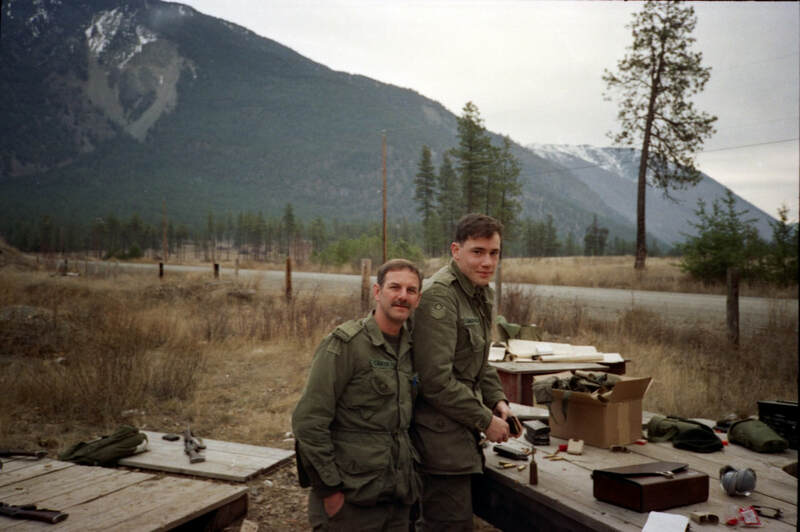 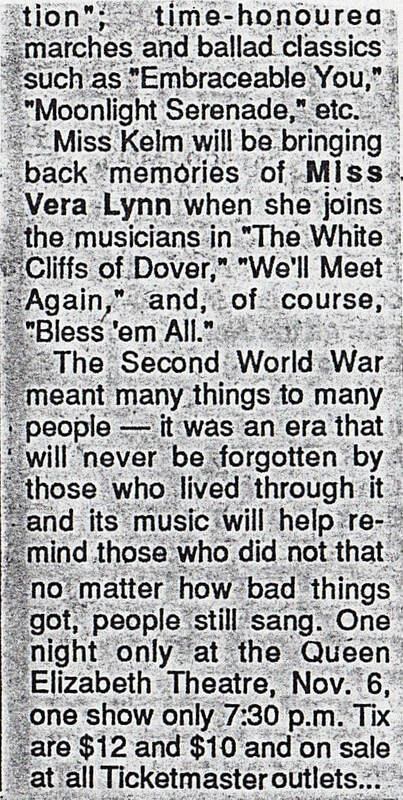 Don was taken on strength as a Gunner in 15th Field Artillery Regiment RCA on 18 January 1968 and rose through the ranks to Chief Warrant Officer and his appointment as Regimental Sergeant Major on 19 January 1980. He was subsequently commissioned Captain on 5 November 1981, and retired from the Canadian Forces on 26 January 1985. 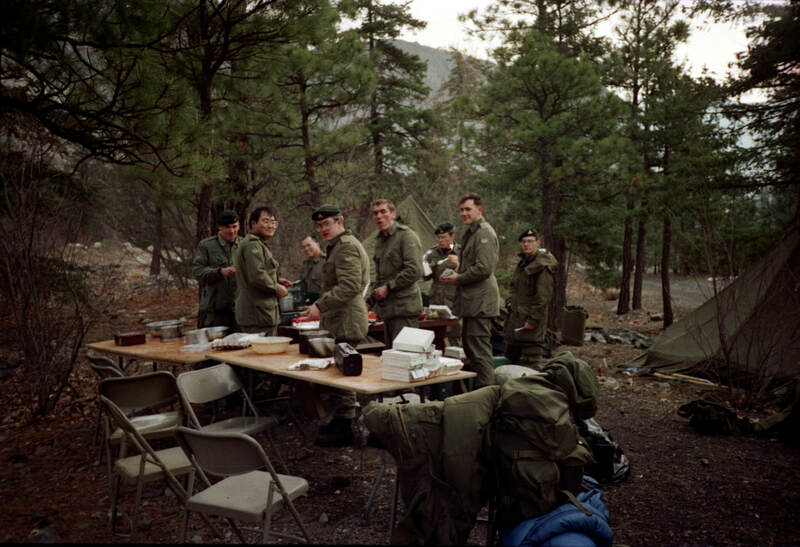 Don was also a member of Canada Customs.